Both Jim Friedman, gifts and endowment director of the Federation, and the sponsoring donor felt very strongly that there had to be a beautiful work of art as the focus of the installation. 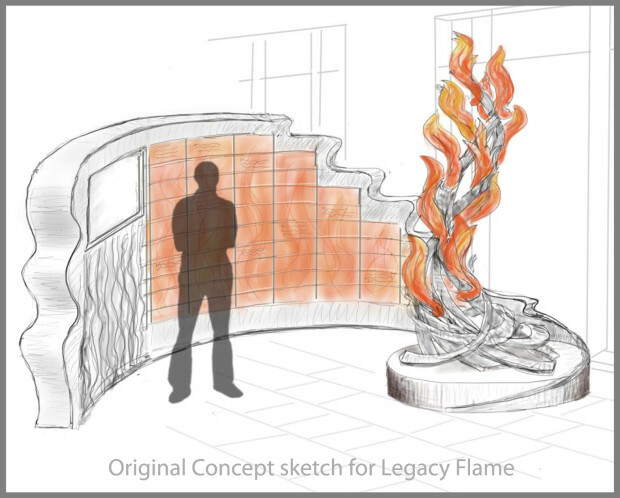 The eternal flame concept is very important in the Jewish faith and was used as the essential basis for the sculpture. 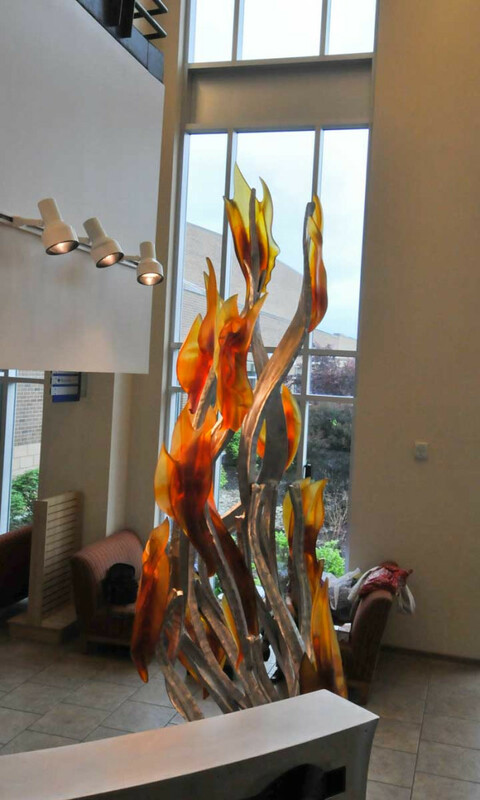 The vertical flame sculpture was designed to be a beacon, visible immediately upon entry into the building, drawing visitors to the interactive video component where they could learn about the history of the Jewish community, watch video interviews with members and become informed about the work of the Federation. 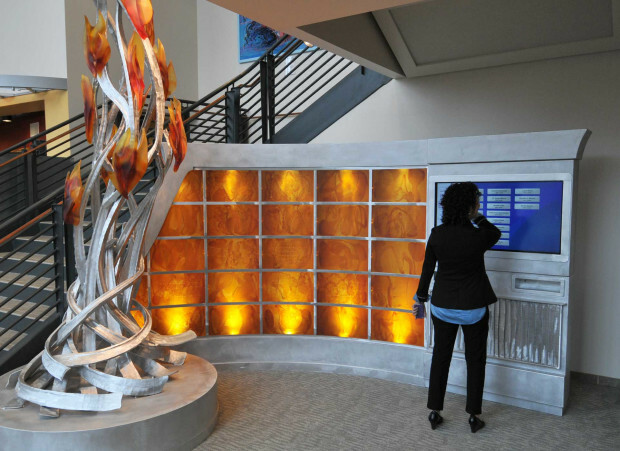 The stairwell space available at the Mayerson JCC required careful integration of the sculpture, wall and interactive video installation. While centrally located in the center of the building, this awkward space was previously an unused eyesore and repository for spare chairs. 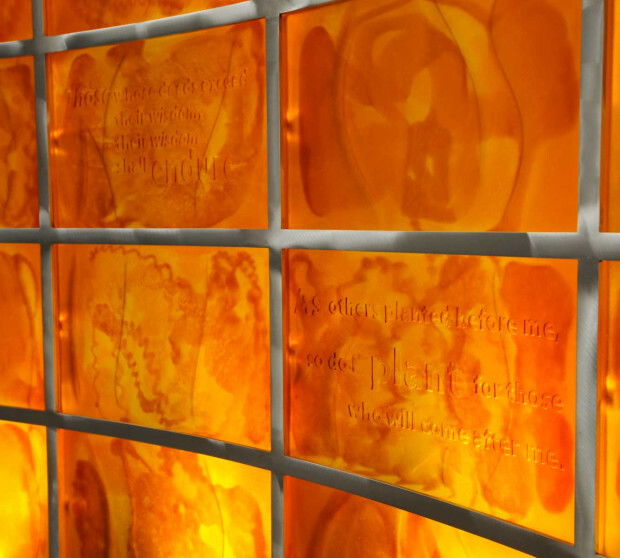 The illuminated glass wall features rabbinical quotations and a subtle flame motif. Its illumination lights the way in the dark area underneath the staircase, with the touchscreen monitor located at the right end. 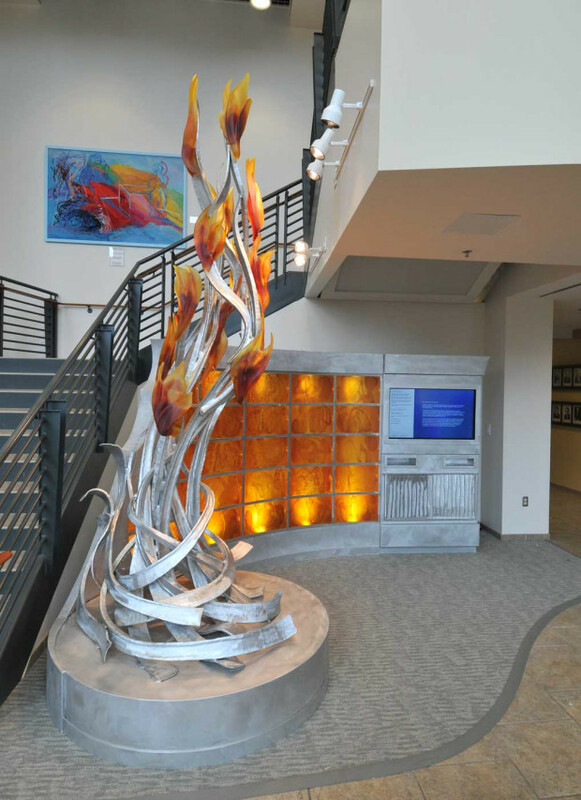 The JFC had originally thought to simply purchase an existing work of art as a focal point for their office presence in the JCC, but after discussions with Ms. Hewett they began to understand the increased options of a commissioned sculpture. Russell was given the brief and, after some explanatory discussions, produced a series of sketches which were reviewed by the board of the JFC. They came back to Hewett and Russell with the request for a donor recognition component, which inspired Russell to design the glass wall, as well as the concept of the interactive video, which they had seen at another Federation facility. Also during this time the new director of the community center introduced the idea of the more central stairwell location. This more vertical space led to an increase in the sculpture's height from 9' to 12', and the video component was expanded upon. Since the area under the stairwell was unfinished, a construction team was assembled by project manager David Harris. He coordinated the timely completion of the renovation as well as the various parts of the project: audio, video, electrical, carpet and logistics. The project's scope became much more expansive over the 2 year development period and now satisfies more goals: community involvement though the ongoing production of video interviews and historical photograph submissions; donor recognition; and the ability of the JFC to relate its mission. 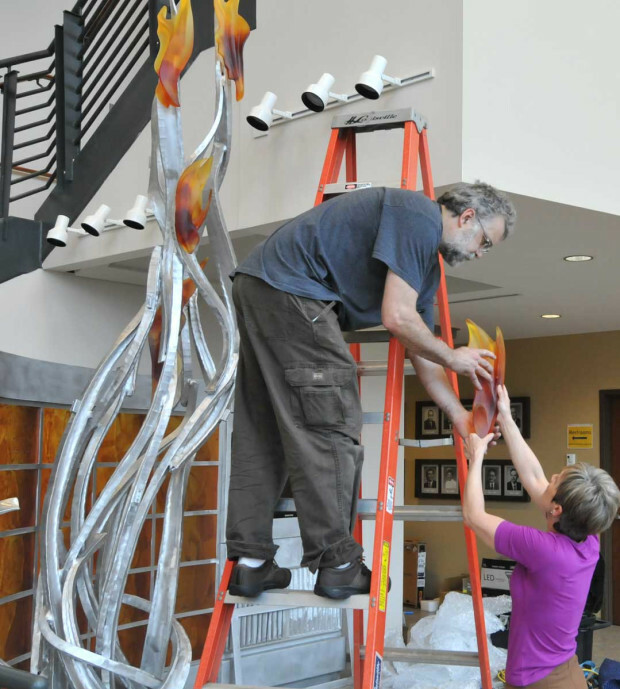 And, the JCC now has a beautiful sculpture to please the eye and lift the heart of every visitor!